A site for food, crafts, art, photography, and all my favorite things! For our road trip I decided to make Kelsee, our amazing dog/house sitter a cake and us mini road cakes. 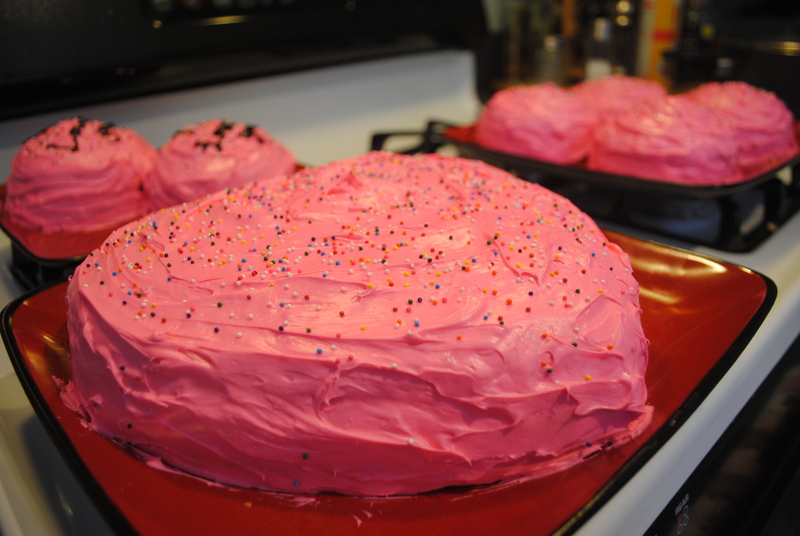 My husband hates chocolate, and I LOVE raspberry…so naturally I went with vanilla cake and raspberry filling. 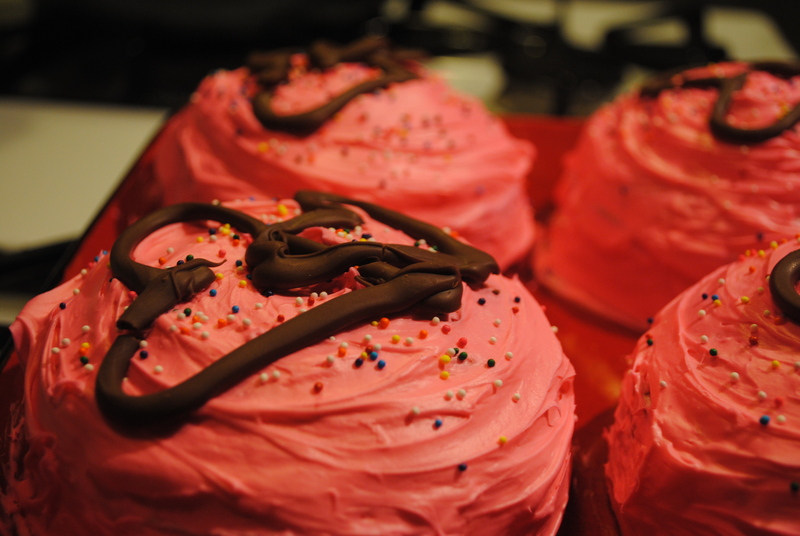 Now our trip was our Valentines weekend, so I made pink cream cheese frosting and put sprinkles on it. 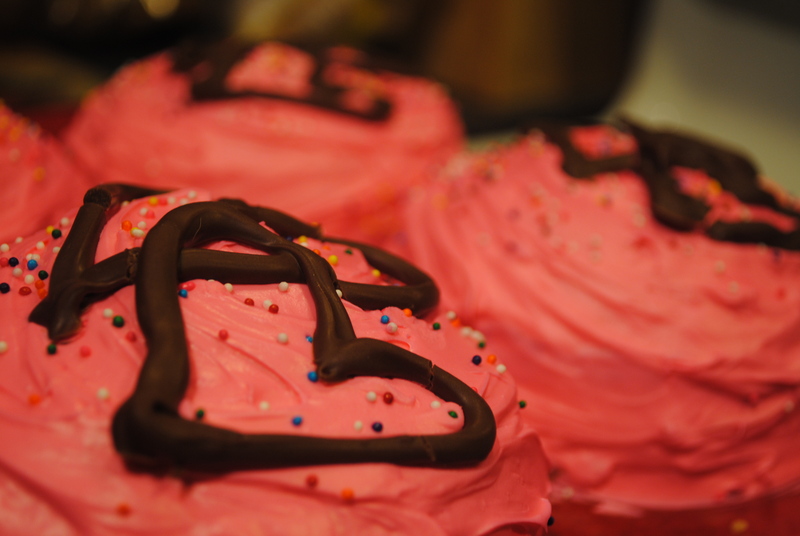 Then I decided to melt some chocolate and squeeze it into chocolate hearts on the cakes in light of Valentines day. They came out awesome! Did I mention the big cake for Kelsee was heart shaped?! I went all out! The big heart shaped one came out awesome, and Kelsee said they loved it! It looked so cute, although I didn’t get a picture of it when I wrote Thanks You Kelsee and put some hearts on that as well. Too bad…maybe next time! The mini ones looked great as well. 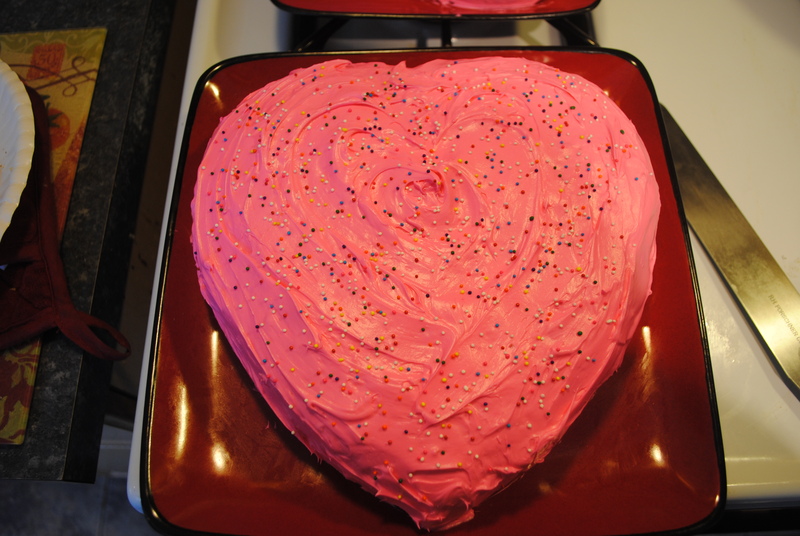 I really wanted to make the mini ones heart shaped as well, but I couldn’t find my mini heart cake pans. 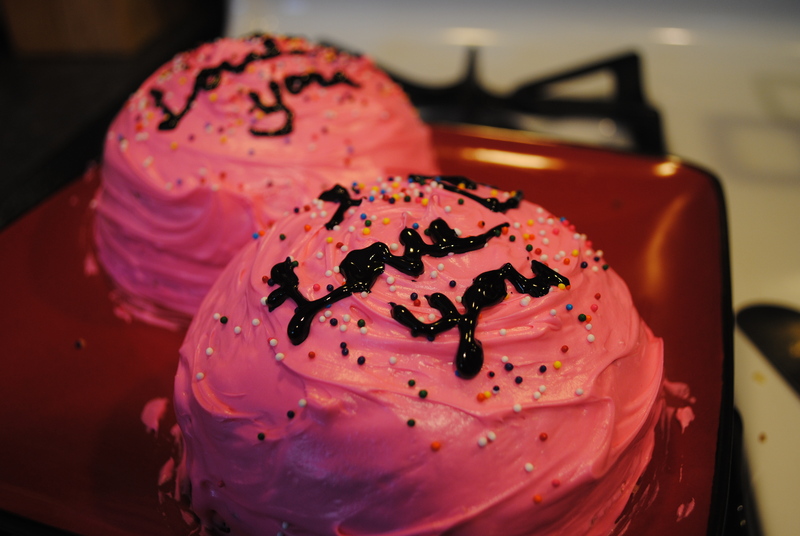 I made some, I Love You cakes for Andrew, and some plain ones for our road trip! I used a regular boxed vanilla cake. Cook as directed on the box. Then, I took a frozen bag of raspberries and put them in a pot on medium heat with a little bit of sugar…maybe a half cup. I heated them until they were broken up and mostly liquid. They weren’t as thick as I wanted them to be, so I added maybe a teaspoon of flour, boiled them, and then turned them down and simmered them until they were thickened and saucy. Then, I cut the mini cakes in half, or for the 9″ I cut the top off of one of the cakes. 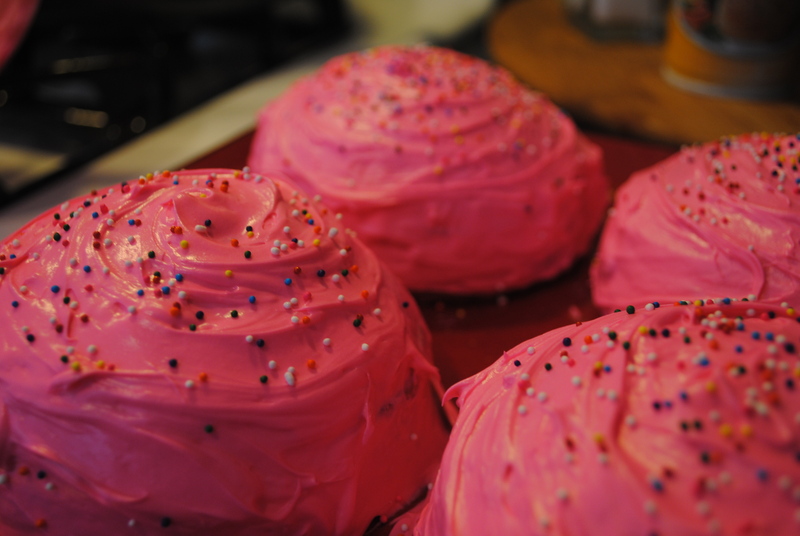 In the middle of the minis, or on top of the cut 9″, pour raspberry filling and spread almost to edges. 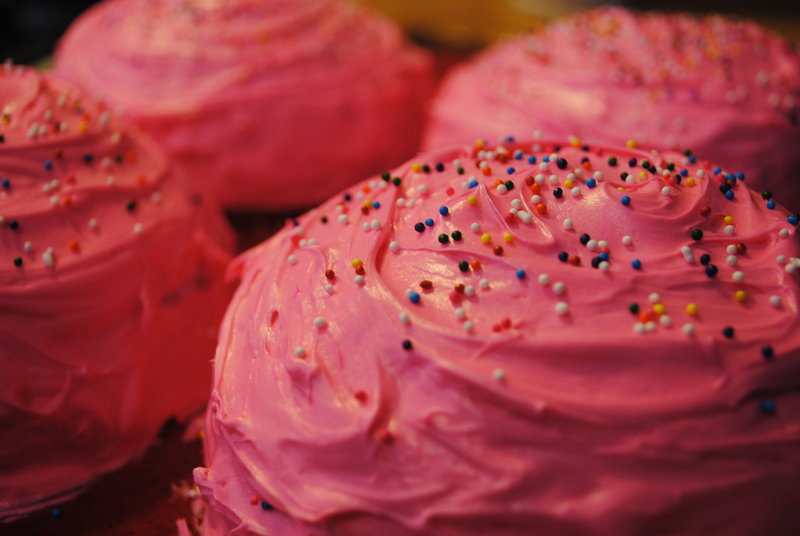 Place second 9″ or top of minis on top and frost with cream cheese frosting. Beat butter and cream cheese until smooth and creamy. Gradually beat in confectioners sugar until desired consistency. At this time, you may add in milk or heavy cream a Tablespoon at a time until desired consistency. I personally, do not like it as thick, because I have a hard time spreading it on the cake. The thinner it is the easier, although too thin and it won’t stick, so be careful! For the hearts I just melted chocolate, put it in a plastic bag and waited until it was a little thick and cut the corner. I put tin foil down and squeezed out some hearts. 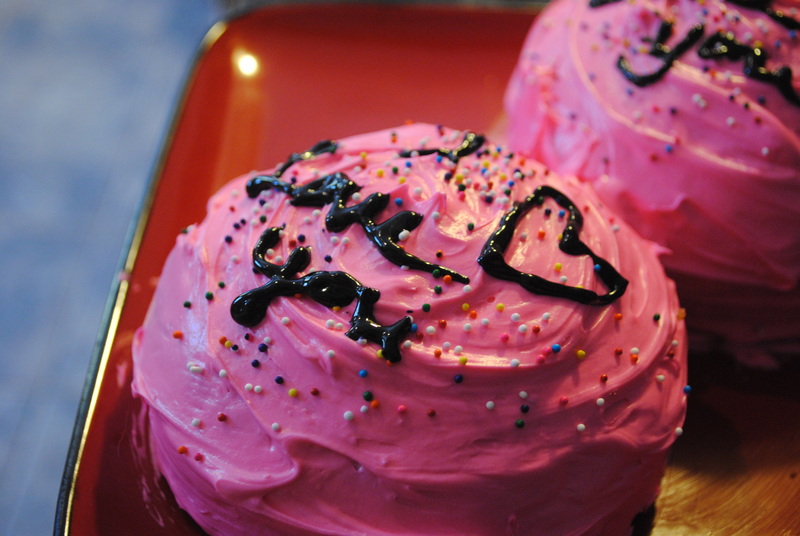 I let the chocolate harden up and then peeled the hearts off the tin foil and placed them on the cakes. Simple! I spent so long drooling over this cake in a Better Homes and Gardens magazine until I finally had a reason to make it. I decided that since we were having Thanksgiving at our new home this year, this would be the perfect dessert for our dinner. I had so much to do, as it was my very first Thanksgiving dinner, so I stayed up all night the night before and prepared it. It really wasn’t difficult, it was just a lot of steps. I prepared everything the night before and then frosted and put together the cake in the morning. I waited until just before we ate to sugar the cranberries so the sugar wouldn’t melt off. It was probably one of the best cakes I have ever had, or made, and I was shocked because the cranberries really didn’t excite me at all. I was thinking of switching to raspberry instead, but I decided against it. I would, however, recommend using raspberries another time because it would be fantastic both ways. I linked the original recipe from Better Homes and Gardens, however I did change a few things and I think next time I may just use box cake, as it is just as moist and much quicker. I think box cake is just as good, if not better than homemade. Maybe the ease of only adding egg and water makes it seem better, but I see no significant difference aside from preparation. I hope you all find the time to make this delightful treat and enjoy it as much as all of us did, it definitely got rave reviews. 2 1/4 Cups Cake Flour OR Reduce All Purpose Flour by 2 TBSP and add 2 TBSP of cornstarch. Mix well. Combine egg whites and buttermilk mixture and let stand at room temperature for 30 minutes. Grease and flour cake pans. Mix together flour, 1 3/4 cups sugar, and baking powder. Stir vanilla into buttermilk and egg mixture. Beat butter, stir in flour mixture. Stir in buttermilk mixture and mix well until smooth. Pour batter into cake pans and bake 25-30 minutes, or until done. Cranberry Filling: Combine cranberries, 1/2 cup sugar, cinnamon, ginger, cloves, and orange juice in saucepan. Boil, reduce heat, and simmer about 10 minutes or until cranberries pop and filling starts to thicken. Mash cranberries and transfer to a bowl to cool. To assemble cake: Cut top from first cake layer so it’s flat. Spread cranberry filling into middle leaving approximately 1/4-1/2 inch around edges of cake. Top with second cake layer. Spread Cream cheese frosting over entire cake. 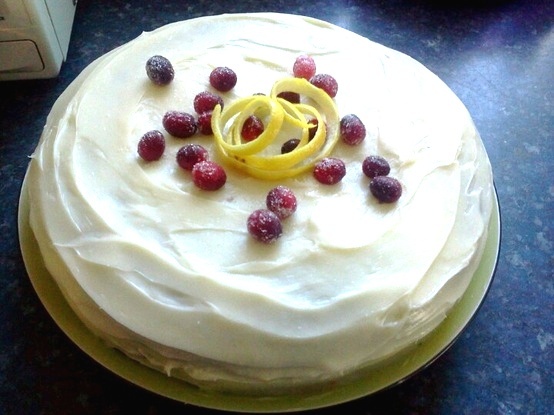 Garnish with sugared cranberries and lemon peel spirals. Beat cream cheese and butter until smooth and creamy. Gradually beat in powdered sugar and lemon juice. At this time, you may also beat in milk to desired consistency. I peronally, did not have to add any milk, although I tend to not measure, so if you measure you may come out with a different consistency, or, some people desire a thicker or thinner version. It really just depends on how you like it, it does not change the flavor. If you add milk, beat in 1 TBSP at a time until you are happy with it. I know it seems like an extensive cake, but like I said, if you decide to use a boxed cake just add in the few ingredients that are not in a box cake normally, and it will cut it down. The cranberry filling was quick and easy and delicious and if you use raspberry follow the same instructions and same ingredients. PLEASE find time to make this delicious cake and ENJOY! Enter your email address to follow my blog and receive notifications of my new posts by email!